For over thirty years, Betsy has channeled her creative and artistic talents into the study, appreciation and replication of Early American decoration and now, since 1996, American Academy School Girl Art. Ms. Salm commissions fine cabinet makers to create period furniture and accessories using elegant woods of curly (tiger) and birds-eye maple, mahogany, satinwood, ebony, and flame birch. Elaborate motifs are then delicately and whimsically applied, using India ink and watercolors. Her professional finisher takes great pride in sealing the work and protecting it for many years and generations to come. 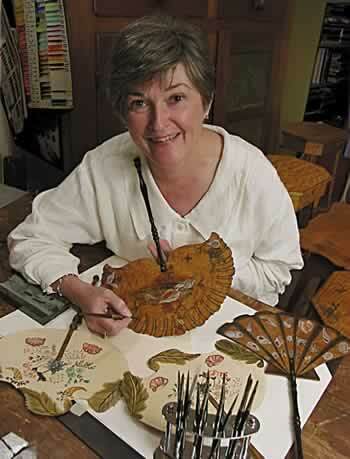 She is a juried member of the Historical Society for Early American Decoration. Her many skills include: country tin painting, stenciling and gold leaf techniques, botanical illustration and trompe l’oeil. English Pontypoole Painting and Freehand Bronze stenciling of trays were two of her favorite forms of ornamental work before she undertook this new, and little known, American art form. To the best of her knowledge, she is the only person in the world presenting School Girl Art as a genre. Each piece in her extensive collection represents those found in some of Americas finest museums and private collections. She loves to share her information and has given slide presentations and lectures to museums, historical societies and fellow artisans. Ms. Salm has been featured in numerous magazine articles. She has been juried into the annual Early American Life Magazines Directory of Outstanding Artisans since her formal introduction of her collection in 1998. Her Work can be viewed at several galleries and juried Shows throughout the year, including the Designer Craftsman Shows at Philadelphia and Boston as well as the Fine Craftsmen Show at the prestigious Wintethur Museum. In 1999 she was honored with a request to create an ornament for the White House Christmas tree. She has been a featured guest artisan on television's Discovery Channel. Ms. Salm is actively engaged in research and assembling her journals from the past 30 years. Her recently published book, Women's Painted Furniture provides a detailed insight of the history and techniques of School Girl Art. Betsy has also been the focus of articles in House and Garden, Country Living, Early American Homes,the Nantucket Inquirer and Mirror, and Antiques and the Arts Weekly. Ms. Salm was honored in February 1999 at the prestigious Designer Craftsman Show in Valley Forge Pennsylvania, and again in the August 2000 issue, by being named to the Early American Homes Directory of Traditional American Crafts. In addition to being listed in the Directory in the August 1999 issue of the magazine, the historic (1835) Greek Revival home she shares with her husband Thomas was featured in the October 1998 issue. 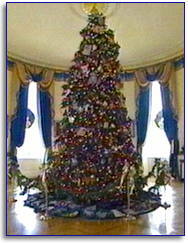 In 1999 Ms. Salm was invited to create an ornament for the Christmas tree in the Blue Room of the White House, an honor extended to only two hundred craftspeople throughout the United States. In collaboration with the National Historic Trust and the Save America's Treasures program, this event honors and preserves our nation's historic art and antiquities. Ms. Salm joined her fellow craftspeople in an event with the President and First Lady at the White House to celebrate the Holidays and our rich cultural heritage. President and First Lady at the White House to celebrate the Holidays and our rich cultural heritage. Click here to learn more about the Save America's Treasures Program. In August, 2002 Betsy appeared on Discover Channel's Christopher Lowell Show, "Old World Techniques"
Over thirty years of research and collecting have brought Ms. Salm to the level of expertise she holds today in this relatively unknown aspect of our cultural heritage. In her continuing effort to educate the public about this all-but-forgotten art form, Ms. Salm has developed a multimedia lecture for presentation to interested parties.